It is time to prepare a pretty prickly pear punch for our pink party. 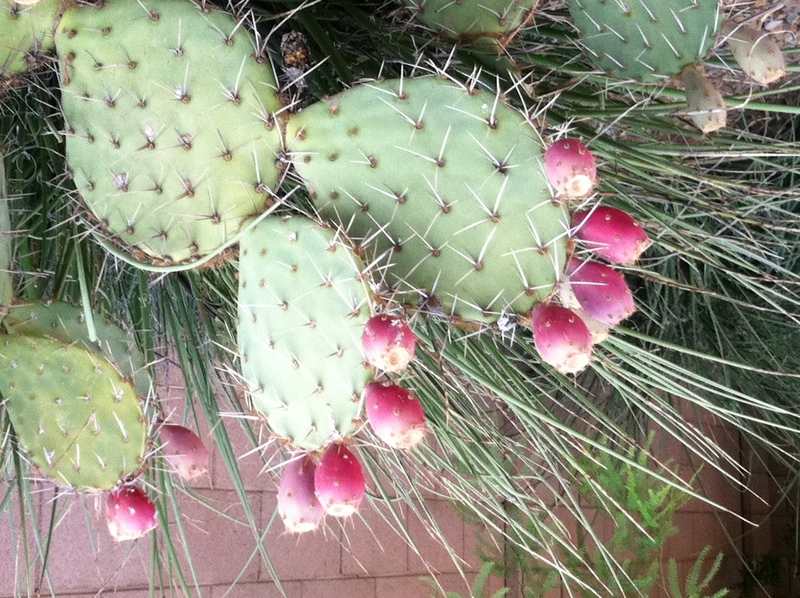 In our part of the country prickly pears grow like weeds. Prickly pears produce fruit that have a bright pink liquid, almost fuchsia in colour. It has a sweet taste, almost like cotton candy or bubble gum. Prickly pear products are always good for supper invite. A bright fuchsia sorbet or margarita is met with ‘oh’ and ‘ah’ and a few ‘what the hells?”. 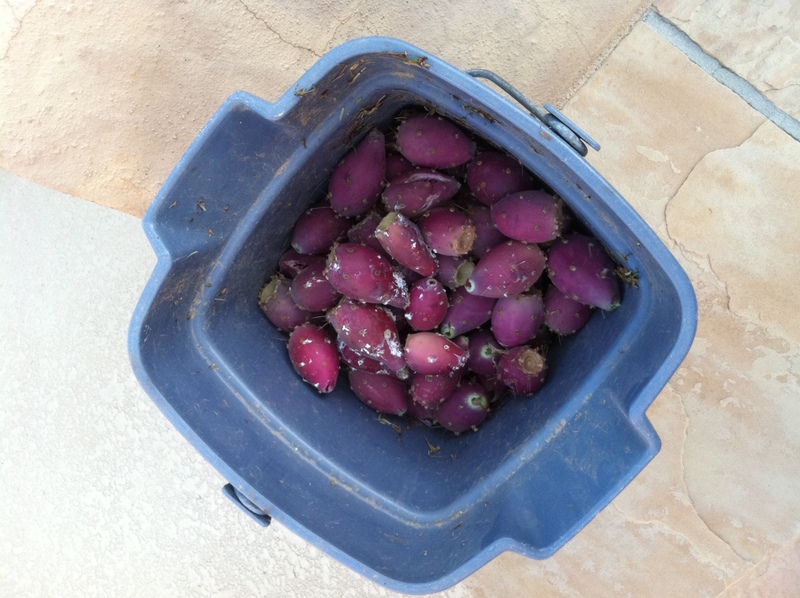 The first step: picking prickly pears from public property plants, of which we have plenty. This is best done in the morning before it gets too hot and before passers-by want to know what the hell you are doing. Apparently I am a tad early as many were not quite ripe. But this morning’s endeavor is merely the ‘first sweep’. Tomorrow I will get more. Then comes the task of cleaning and mashing and cooking. A pleasingly positive perspective on a potentially persnickety problem. Your proposed potions promise profound pleasure. Prost! I’ll be interested to see what you do with them. We used to eat them at Christmas time. A belated Happy Birthday Michael, 49 years young! I like cacti quite a bit 🙂 They are pretty and sturdy. There’s a cacti exhibit in Hershey, PA that I like quite a bit. I simmer them in water, then I mash them with a potato masher. Strain all through cheesecloth, to get bright fuschia pink liquid for drinks and sorbet etc. jolly good fun ! I wonder what made someone try such a thing in the first place! the javelinas love them ! Humans imitate ! I’m confused…Why can’t you wear your Daisy Dukes? 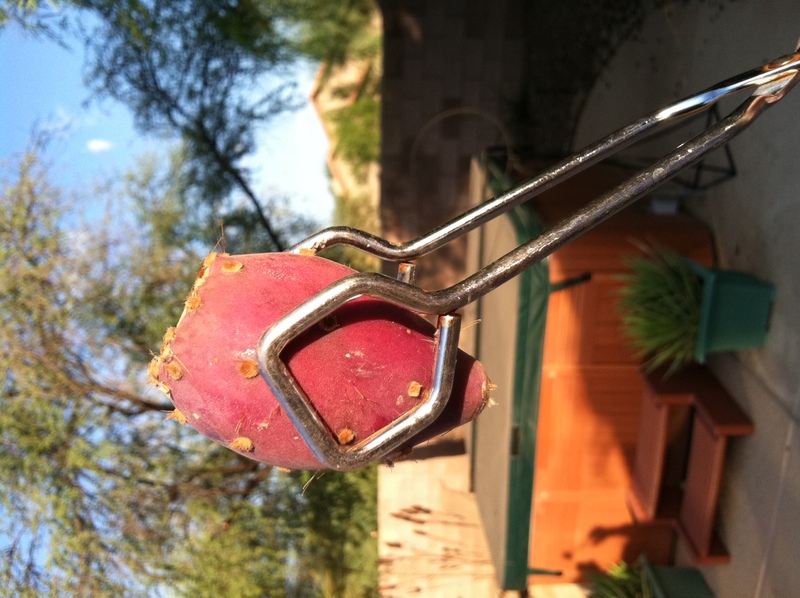 In season, we can get prickly pears by the case here in the grocery story, and they are delicious! 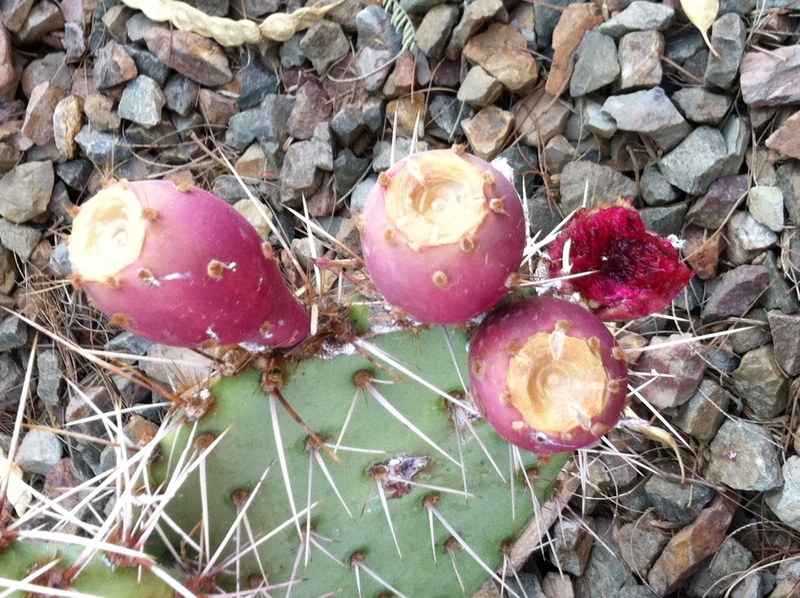 working around cacti in short pants can be painful – ouch ! Well, Spo, you finally have made something I’m completely unsure about…….Cactus…..hm….have to think about that one. That’s quite a process…….